Apatow is no stranger to producing comedic hits and when I heard the very producer of Bridesmaids would be back at it with a stellar cast, I couldn’t help but to be elated by the prospect of a well-made comedy. Trainwreck surpasses any expectation I could have had going into the theater. The film begins with a father parenting his children in an unconventional way. “Monogamy isn’t realistic,” he says to his two daughters, reiterating and emphasizing his point with an outlandish analogy of not wanting his daughters to settle with playing with one doll when infinite dolls exist—you can see where he was going with that. Fast forward twenty years later and we meet the wonderfully written character Amy. Schumer truly outdid herself with not only writing this role but also putting her comedic genius into bringing this character to life. Schumer does a great job at bringing her signature comedy to the forefront all while giving the audience a candid look into the types of relationships Amy develops, which hold true to the types of relationships that many adults share today. This new spin on a romantic comedy should go to show that staying away from the formula is sometimes worth it. Rather than acting like a damsel in distress, Amy takes charge as a strong woman and lets the world know exactly what she wants. Amy is never afraid to approach a guy and have him come over to her place and she smartly follows her dad’s outlook and makes sure the men go about their way before the thought of staying over even crosses their mind. A deeper facet into Amy that gives the film the delicate balance between comedic candor and a deeper look into Amy is Amy’s family life. Not only is the audience given an inside look at the cracks in Amy’s family but we see her navigate through hardships and through plenty of laughs along the way. 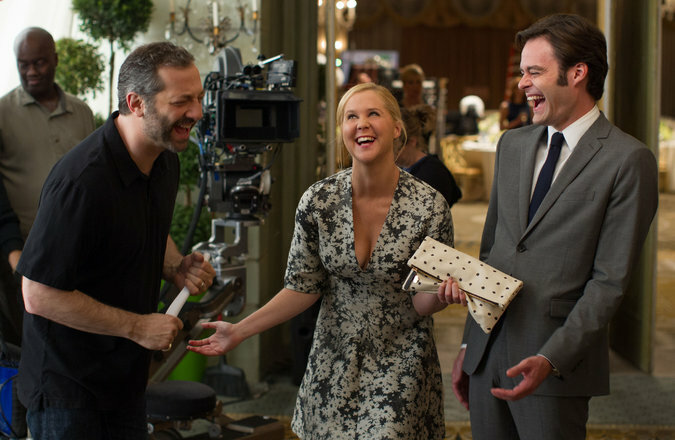 Trainwreck offers the perfect balance of providing comedy but still giving the audience an inside look into these characters’ lives—a really sincere and powerful look. Amy juggles problems with managing the cost of her dad’s assisted living all while dealing with the very thing she’s always avoided: monogamy. As a writer, she’s assigned to cover a profile of Aaron Conners (Bill Hader), a rising and notable name in sports medicine, leaving her to deal with an influx of feelings storming towards her. After spending one night with Amy, Aaron is convinced that he and Amy have a connection and his conviction ends with the fruition of the couple. As with all relationships, we get to see the rollercoaster of emotions and occurrences that pull them further apart and bring them closer together all in one package. Overall, Trainwreck truly delivers and I would definitely watch Trainwreck a million times over.